Ninety seven per cent of senior journalists and editors working for the UK’s regional newspapers and news sites say they worry that that local newspapers do not have the resources to hold power to account in the way that they did in the past, according to a survey carried out by the Society of Editors and Index on Censorship. And 70% of those respondents surveyed for a special report published in Index on Censorship magazine are worried a lot about this. The survey, carried out in February 2019 for the spring issue of Index on Censorship magazine, asked for responses from senior journalists and current and former editors working in regional journalism. It was part of work carried out for this magazine to discover the biggest challenges ahead for local journalists and the concerns about declining local journalism has on holding the powerful to account. The survey found that 50% of editors and journalists are most worried that no one will be doing the difficult stories in future, and 43% that the public’s right to know will disappear. A small number worry most that there will be too much emphasis on light, funny stories. There are some specific issues that editors worry about, such as covering court cases and council meetings with limited resources. Twenty editors surveyed say that they feel only half as much local news is getting covered in their area compared with a decade ago, with 15 respondents saying that about 10% less news is getting covered. And 74% say their news outlet covers court cases once a week, and 18% say they hardly ever cover courts. The special report also includes a YouGov poll commissioned for Index on public attitudes to local journalism. Forty per cent of British adults over the age of 65 think that the public know less about what is happening in areas where local newspapers have closed, according to the poll. Meanwhile, 26% of over-65s say that local politicians have too much power where local newspapers have closed, compared with only 16% of 18 to 24-year-olds. This is according to YouGov data drawn from a representative sample of 1,840 British adults polled on 21-22 February 2019. The Index magazine special report charts the reduction in local news reporting around the world, looking at China, Argentina, Spain, the USA, the UK among other countries. “A less informed society where news is replaced by public relations, reactive commentary and agenda management by corporations and governments will become dangerously volatile and open to manipulation by special interests. Allan Prosser, editor of the Irish Examiner. “The demise of local reporting undermines all journalism, creating black holes at the moment when understanding the “backcountry” is crucial. Belgian journalist Jean Paul Marthoz. The special report “Is this all the local news? What happens if local journalism no longer holds power to account?” is part of the spring issue of Index on Censorship magazine. Rachael Jolley is editor of Index on Censorship. She tweets @londoninsider. This article is part of the latest edition of Index on Censorship magazine, with its special report on Is this all the Local News? 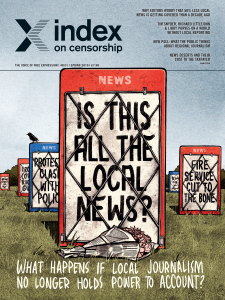 Index on Censorship’s spring 2019 issue asks Is this all the local news? What happens if local journalism no longer holds power to account? We explore the repercussions in the issue. Look out for the new edition in bookshops, and don’t miss our Index on Censorship podcast, with special guests, on iTunes and Soundcloud. 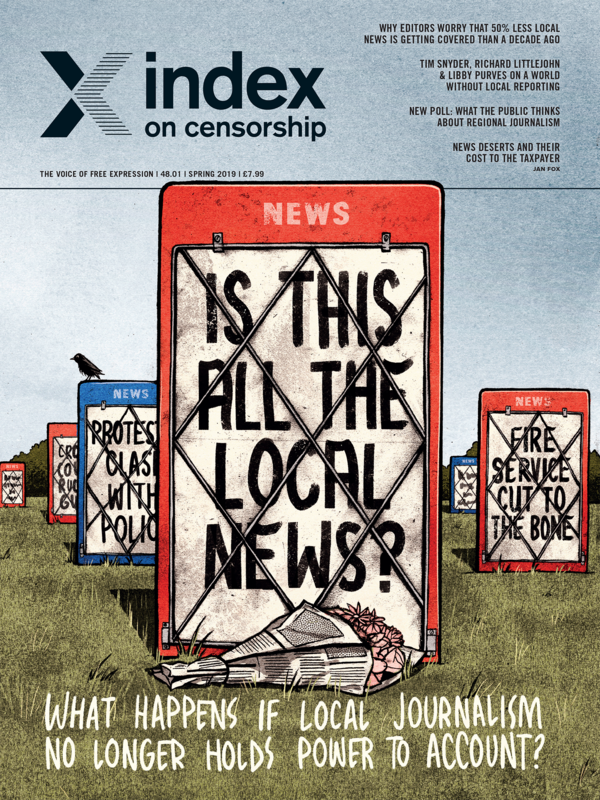 The spring 2019 issue of Index on Censorship magazine explores what happens to democracy without local journalism, and how it can survive in the future. Rachael Jolley is the editor of Index on Censorship magazine. Having started as a news reporter on a regional newspaper, she moved on to writing for magazines, newspapers and websites in the UK and internationally (including The Times, the Financial Times and The Guardian). She has been editorial director at think tank British Future, managing editor for monthly magazine Business Traveller, and editor of Business Traveller Middle East, as well as Head of Online for the Fabian Society. She writes regularly for the New Statesman and other publications and co-wrote the play Murdering The Truth (Greenwich Theatre).